Earlier, some new details on the Batman v Superman Ultimate Cut (which you can pre-order by clicking here!) were released, a version set to debut this summer with 30 additional minutes of footage. 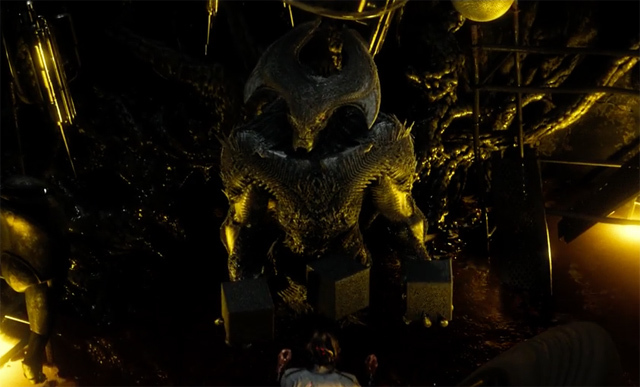 Now, inexplicably, Warner Bros. has released a deleted scene from the film, featuring Jesse Eisenberg’s Lex Luthor and an unidentified model of some creature, who appears to be holding Mother Boxes, the technology from Darkseid’s Apokolips and the same device used to turn Victor Stone into Cyborg. Who is this character unseen in the theatrical cut of the film? Though unlikely, is that what Darkseid will look like in the upcoming Justice League? At what point was this supposed to fit into “Dawn of Justice?” Sound off with your theories in the comments below! The Zack Snyder-directed Batman v Superman: Dawn of Justice stars Henry Cavill as Clark Kent/Superman, Ben Affleck as Bruce Wayne/Batman, Gal Gadot as Diana Prince/Wonder Woman, with Amy Adams, Laurence Fishburne and Diane Lane returning from Man of Steel, joined by Jesse Eisenberg as Lex Luthor, Jeremy Irons as Alfred, Holly Hunter as Senator Finch, as well as Scoot McNairy, Callan Mulvey and Tao Okamoto.